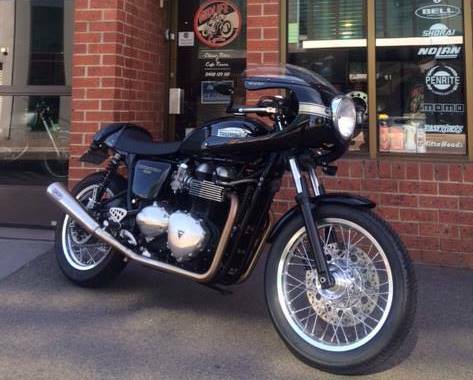 Triumph Performance – from Warm to Wild! 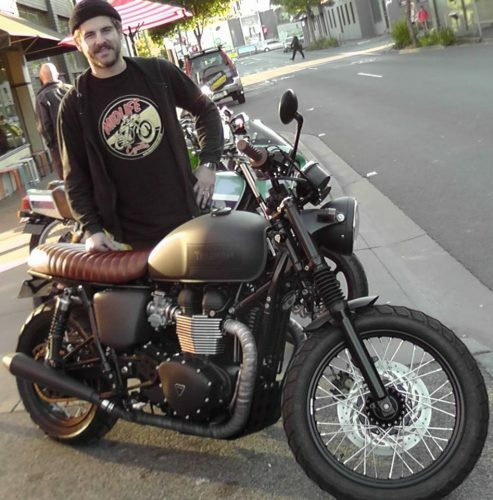 Mid Life Cycles has joined forces with renowned engineer Andrew Hallam of Hallam Racing to develop a range of performance packages for late-model Triumph Bonnevilles, Thruxtons and Scramblers and their Triumph America and Speedmaster cousins. 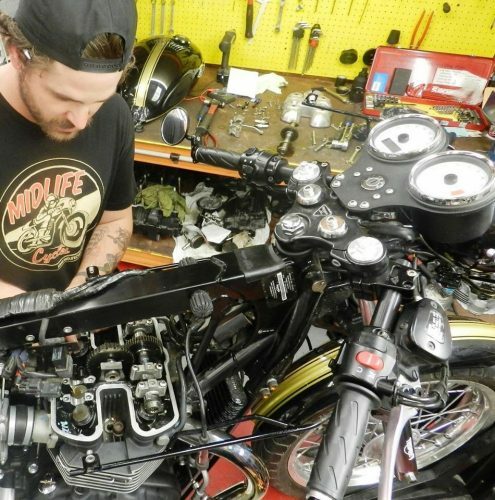 The performance mods apply to the 865cc Triumph twins in both EFI and earlier carburettor form and to the 180 and 270-degree cam engines. Developed and dyno-tested by Hallam Racing and fitted in the Mid Life Cycles workshop by experienced Triumph technicians Charlie Hallam (pictured) and Nic Sutcliffe, the performance modifications range from a relatively straight-forward camshaft upgrade through a series of camshaft and intake-related improvements to the full-house Hallam Racing mods perfected during the development of Triumph’s own Salt Racer engine. At last count, Mid Life Cycles had modified more than 15 customer bikes with several more in the workshop undergoing major performance improvements. 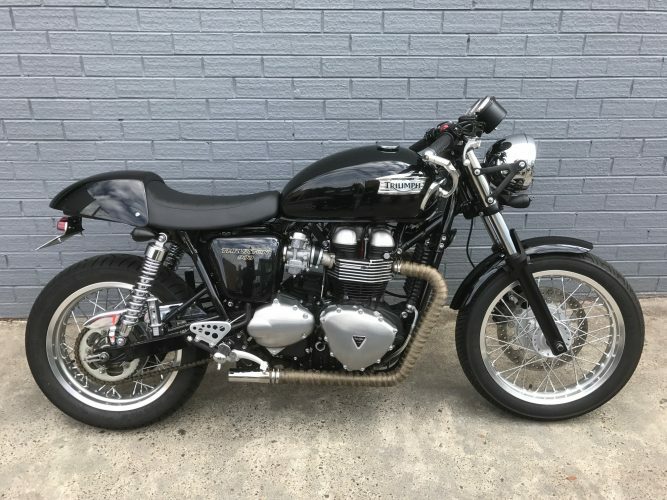 The Stage 1 Cam Upgrade takes the soft-tuned Bonnie / Thruxtons from a dyno-measured 36 horsepower at the rear wheel to 60-plus horsepower – that’s around a 70 percent improvement for an outlay of about $1500 ($1600 for the Scrambler). This has proved more than enough for many Mid Life Cycles customers, who describe the Stage 1 kit as “what Triumph should have produced in the first place”. Most bikes also receive suspension improvements over standard to make the trad-Triumphs handle much better than stock. 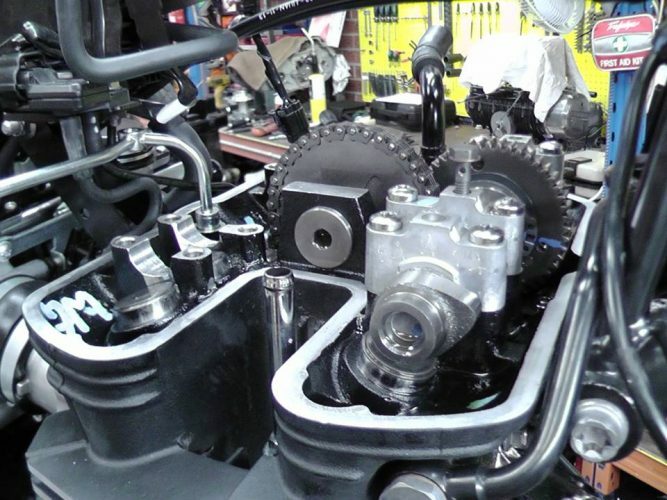 Recently, several Mid Life Cycles customers have opted for the Stage 3 Cam Upgrade kit, which utilises a more aggressive inlet cam as used on Triumph’s Salt Racer, a modified exhaust cam and a series of other tweaks, plus fitting and dyno-tuning a Power Commander. All of this work comfortably doubles the horsepower of the standard bike and there’s a big lift in torque all the way from 48 ft/lb at 3200rpm through to a peak of 55 ft/lb at 6200rpm, tailing off only a little to 50 ft/lb at 8000 rpm. 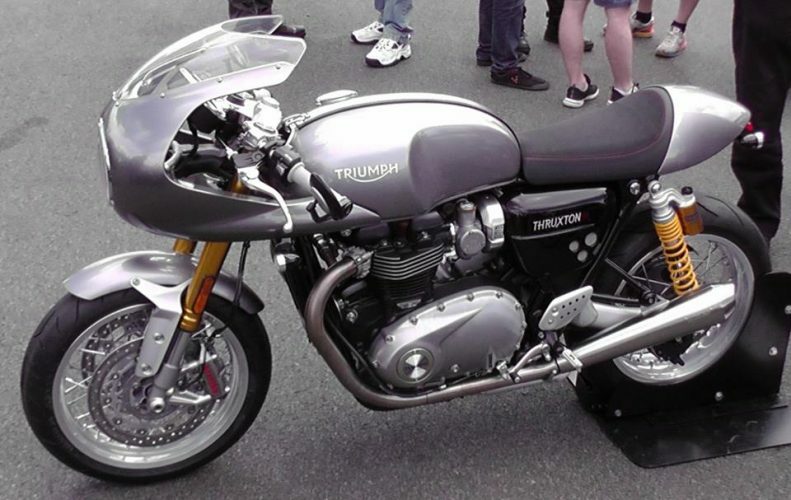 Compare this to the standard (Bonneville / Thruxton) engine’s 40 ft/lb at 3200rpm, dropping to only 32 ft/lb by 6000rpm. And if this isn’t enough, Hallam Racing and Mid Life Cycles take the Stage 3 Cam Upgrade kit as a baseline and offer a series of further performance mods tested and proven in road and race applications. 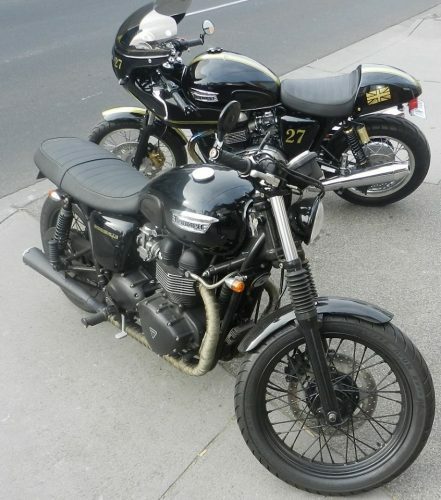 These modifications focus on improved breathing and include porting and matching the manifolds, bigger valves, a small increase in compression and other tuning tricks to get even more from the Triumph twin. And we’ve only lifted the head – there’s still the option of big-bore kits and other goodies! 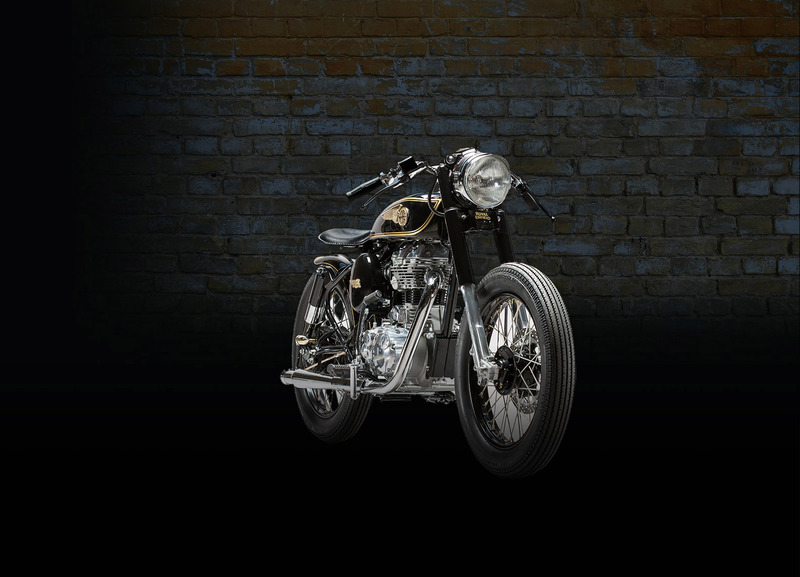 The next step for the Hallam Racing-Mid Life Cycles combo will be performance upgrades for the new 1200-engined Triumphs. Watch this space!